Ahh, I love the pink next to the white. 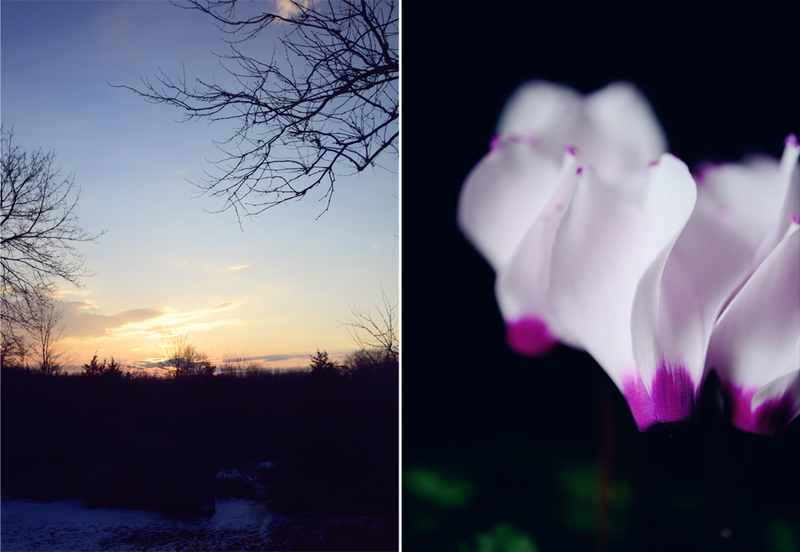 The cyclamen looks like a perfect winter subject. Glad to hear your husband is on the mend. Hope things warm up for you, Mary! Hi Mary, happy to hear your husband is on the mend. Keeping you both in my thoughts and prayers. Looks like you've had a very cold day. Thank goodness for supermarket flowers all winter long! 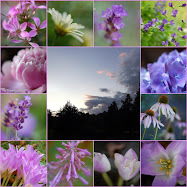 Thanks for sharing your photos, very beautiful. Thanks for hosting. Really lovely photos. Have a nice week. Pink and pretty! Actually more than pretty -- just a beautiful mosaic. And as always thank you for hosting. PS: If anyone reads this and knows Leanne from New Zealand (she's next to me on the linkys here) she has a bad link to her blog -- it comes back to this page. I like the saucer of stems and blooms. A foggy day does offer mysterious looking photos. So glad your husband is on the mend Mary. Thank you for hosting! Aaaaaaaaaaaaaaaaaa! I love this SO much, Mary!!! bbbbbbb..... just spent the entire afternoon working on this kind of thing and there YOU go - it looks so effortless and sweet and... Mary.... your images are so refreshing - as always!!! =] They just make me happy! I'm sure that you know what I mean! Oh, Mary! I just went back up and, actually, read your post.... I missed that your husband was in the hospital this week! Well, I'll add some fresh winds to the prayers! and, I'm just so grateful for you! You have no idea how many times looking at your images lifts my heart and sets me straight and keeps me going! Mary, I am so happy to hear your husband is recovery well. I will keep him in my prayers. I love your pretty pink mosaic. The snowy foggy scene is beautiful. The flowers on both the plate and from the store look lovely. Thanks for hosting, have a happy week ahead! It's good to hear your husband is on the mend Mary. so sorry to hear that your husband has not been well Mary. I wish him a speedy recovery. It is such a worry when one's partner is in hospital. I love the pink on your beautiful pink plate. Is that Geraldton Wax flower I see. If so, then it comes from Western Australia! There is nothing like a few hours wondering with a camera to soothe and calm the soul, whatever the weather. Take care, and thank you again for hosting Mosaic Monday. Glad to hear your husband is at home and recovering well. It takes time. Love the pink cyclamen - so pretty for a February day. Beautiful garden photos, too. Thanks again for hosting Mosaic Monday. It's a fun thing to participate in. Lovely, lovely photos. Glad to hear your husband is doing better. I found Lavender Cottage and now I have found you!! I am just enjoying taking photos and experimenting with what I found out I can do! So I have linked up with you today and began following you as well. I look forward to seeing more of work! Your mosaic is lovely. How can pink not make people smile it's so pretty. I hope your hubby continues to be in the pink too Mary. Absolutely gorgeous. 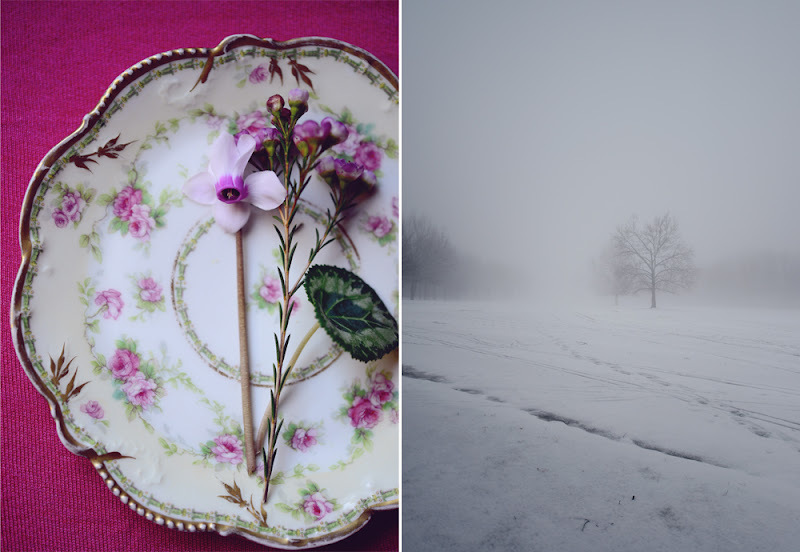 The delicious pink against the snowy white fog...Stunning! Beautiful mosaic, thank you for the party! I love your beautiful mosaic. The contrast is gorgeous! The winter drearys are startinng to get to me and this pink series just may be a cure! Love that first photo especially.